A long journey is getting the exciting resolution it deserves. What started as an ambitious library project with Peace Humanity International and Amizade in Ghana nearly 10 years ago, finally has the catalytic partner it needs. 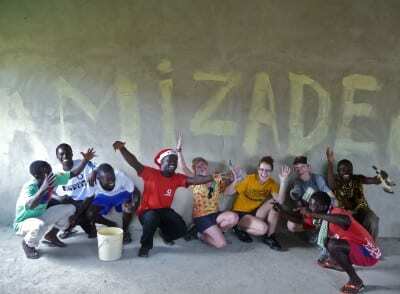 For years, hundreds Amizade volunteers put time, labor, and funds into the giant Ghana Library project. With most of the work completed, including a computer center, the project seemed until recently stalled. However, thanks to Amizade’s new partnership with Hand in Hand For Literacy, the Ghana Library Project will likely come to fruition within a year. The library is in the Amizade site of Jukwa, Ghana. Jukwa is a village of 8,500 and lies in the Cape Coast region of Ghana. Just a little over a decade ago Jukwa had no electricity or public water. This is no longer the case today, but many are still without books or educational materials. When completed, this will be a community library not only for Jukwa. Nearly 21 schools and 10 surrounding villages will directly benefit from this library. The library will be comprised of multiple rooms including a children’s library, adult library, ITC room, offices, conference center, and an educational room. The library will be more than just a learning area, but can also be seen as a community center. In fact, some rooms are already in use by teachers/students and local parliament members. The funds committed for this project will help complete the construction of an existing building as well as fill it with books and educational materials. The library will also be sustainable due to profits from an internet cafe, the rental of the conference room, as well as the sale of food and drink in the snack area. A committee of five individuals (a student rep, a rep of the chief, a rep from the assembly members in the community, a rep from Peace Humanity International and a community rep) will oversee the funds accrued from the profits. These funds will provide the financial support needed to sustain the library. These funds coupled with the hard work of Amizade volunteers and partners will help see the completion of the library very soon.